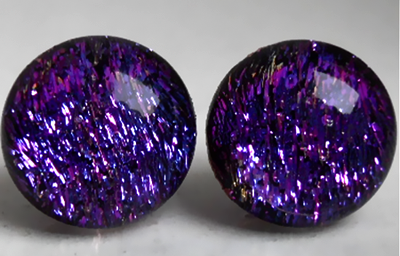 Very sparkly bright Purple Dichroic glass stud earrings. The glass pieces are 1.1cm in diameter. They're made of two layers of glass - a layer of sparkly bright Purple Dichroic glass topped with a layer of clear glass. The fittings are Sterling Silver and they come in a Black or Silver card giftbox.